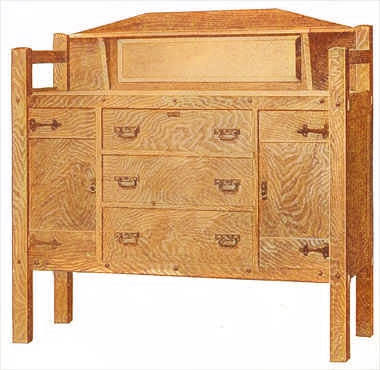 Build a mission style buffet with ample storage from free woodworking plans. Buffet has three drawers and two doors with shelves. Click here for detailed buffet plans. 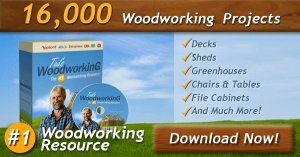 Quarter sawed oak is the best wood to use, as it is easy to work and looks best when finished. Order the stock from the mill ready cut to length, squared and sanded. 2 back posts, 2 by 2 by 47-3/4 in. 2 front posts, 2 by 2 by 45-1/2 in. 4 rails, 1-1/2 by 1-1/2 by 50-1/2 in. 2 end rails, 1-1/2 by 1-1/2 by 18-1/2 in. 4 end rails, 3/4 by 4 by 18-1/2 in. 4 pieces for end panel, 3/4 by 3-1/2 by 21 in. 2 panels, 3/8 by 12 by 21 in. 1 top board, 3/4 by 17-1/2 by 47-1/4 in. 1 back board, 3/4 by 11-1/2 by 47-1/4 in. 1 shelf board, 3/4 by 2 by 46 in. 2 brackets, 1 by 2 by 7-3/4 in. 4 pieces for doors, 3/4 by 4 by 11 in. 2 panels, 3/8 by 11 by 17-1/2 in. 1 piece for drawer, 3/4 by 8 by 22-1/2 in. 1 piece for drawer, 3/4 by 7-1/2 by 22-1/2 in. 1 piece for drawer, 3/4 by 7 by 22-1/2 in. 2 pieces, 1/2 by 8 by 19-1/4 in. ; soft wood. 2 pieces, 1/2 by 7-1/2 by 19-1/4 in. ; soft wood. 2 pieces, 1/2 by 7 by 19-1/4 in. ; soft wood. 1 piece, 1/2 by 8 by 19-1/4 in. ; soft wood. 1 piece, 1/2 by 7-1/2 by 19-1/4 in. ; soft wood. 1 piece, 1/2 by 7 by 19-1/4 in. ; soft wood. 1 bottom board, 3/4 by 17-1/2 by 47-1/4 in. ; soft wood. 2 partitions (several pieces), 3/4 by 20 by 24-3/4 in. 2 front pieces, 3/4 by 2 by 23 in. 2 back pieces. 3/4 by 2 by 23 in. ; soft wood. 2 side pieces, 3/4 by 2 by 21-1/2 in. ; soft wood. 1 back (several pieces), 3/8 by 25 by 46 in. 1 mirror frame (to suit mirror). Start to work on the four posts by squaring them up to the proper length in pairs and beveling the tops as shown. Clamp all four pieces on a flat surface with the bottom ends even, then lay out the mortises for the rails and panels on all four pieces at once with a try-square. This insures getting the mortises all the same height. The back posts also have a mortise cut in them at the top for the back board as shown. Lay out the tenons on the ends of the front and back rails in the same manner. Cut them to fit the mortises in the posts, also rabbet the back rails for the backing. Cut tenons on the end rails and rabbet them and the side pieces for the panels. Lay out the top and bottom boards to the proper size and notch the corners to fit about the posts. These boards are fastened to the 1-1/2-in. square rails with dowels and glue. They can now be glued together and set away to dry. The top board is of oak, and be sure to get the best side up, while the bottom one can be made of soft wood if desired. The partitions are made of several boards glued together. Be careful to get an oak board on the outer edge. The drawer slides are set into the partitions as shown and are fastened in place with screws from the inside. The top back board has a tenon on each end that fits into the mortises in the back posts and is rounded at the top as shown. The shelf is also rounded at the ends and is fastened to the back with screws. A plate glass mirror should be provided for the back. This is fitted to the back board as shown, then the brackets put up at the ends of the mirror frame. The main parts are now ready to be assembled and glued together. Before applying any glue, see that all the joints fit together perfectly. The end rails and the panels are glued together first and allowed to dry. Be very careful to get the parts clamped together perfectly square and straight, else you will have trouble later on. When these ends are dry slip them on the tenons on the front and back rails which are already fastened to the top and bottom boards. The back board and the partitions must be in place when this is done. Pin and glue the joints and clamp the whole together square and leave to dry. The doors are now made by mortising the top and bottom pieces to take the 3/8-in. panel which is glued in place. The drawers are made as shown in the sketch. The front board should be oak, but the remainder can be made of soft wood. The joints are nailed and glued. Suitable hinges for the doors and handles for the drawers should be provided. Antique copper trimmings look very well with this style of furniture and can be secured at most any hardware store. The back is made of soft wood and is put on in the usual manner. Scrape all surplus glue from about the joints, as stain will not take where there is any glue. Finish smooth with fine sandpaper, then apply the stain you like best. The buffet can be finished in any one of the many mission stains available.